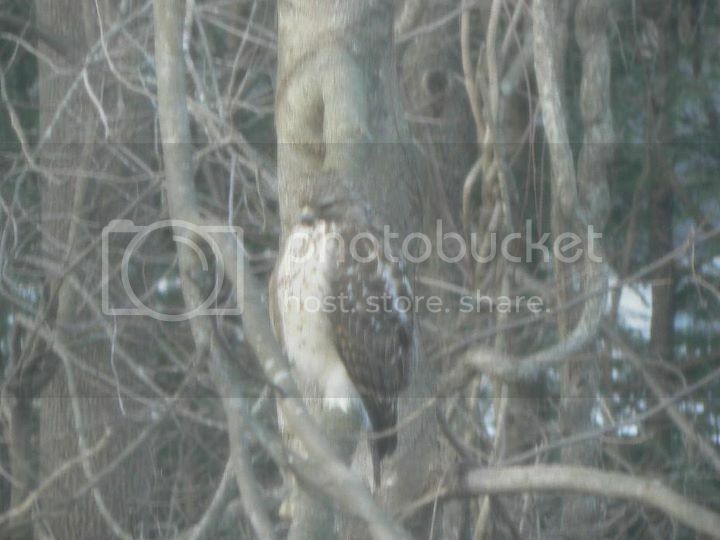 Saw this big bad bird outside in the tree today. Had to be 18" tall, if not more. They grow big here due to all the bunnies and squirrels they're always picking off. Meanwhile, I am watching the Superbowl because I'm not sure if anything else is on and I'm on the computer and I just look up for the ads. I have no idea who is winning the game but I should pay attention so I don't seem stupid when I go to work tomorrow ;) So far the ads are very uneven. A few fun ones, but mostly unmemorable. I mean, would it kill them to use a cute squirrel or other rodent in an ad? Oh wow LJ has changed with the cut thing, which I already mucked up, so will work in the HTML section. Easier. Took a break from sorting stuff in the house as there is sooo much. Did create the leaning tower of paper towels/toilet paper/tissues as we had to buy SO much when my mother was alive that we went through it, like, well, tissue! I'm sure we won't need to buy any until 2013, or maybe even 2014 at this rate! ;) However, while going through some boxes of old papers, found hand-written bills from a local hardware store from 1959! Now that I can actually watch TV (unless I fall asleep) I've discovered that CBS' Person of Interest is rather interesting. In fact, I'll tune in for each week. I always tune in for Big Bang Theory as it's the best sitcom out there. Speaking of JIm Caviezel in Person of Interest why or why could they not have cast him as Jack Reacher in the upcoming One Shot movie. I don't know if anybody else reads these Lee Child novels - I just got started via audiobooks from the library - and he'd be perfect in that loner role. Of course, it's tough to find anybody who is 6'5" and can act, but Jim is tall enough, but no, they cast Tom Cruise. I mean, seriously, why? I can't see him carrying off a character who has, in one novel, lifted a car up. Aiee, Hollywood at its worst. I still remember the travesty that was War of the Worlds. I was rooting for the aliens to blow up the planet. Meanwhile, I do highly recommend the book by Sam Kean entitled The Disappearing Spoon: and other true tales of madness, love, and the history of the world from the periodic tabl eof the elements which is just what it is. A general but interesting history of the elements, who discovered them, used them, abused them, etc. Was able to go through two Stargate novels. First, there was the Legacy book, "Allegiance," which was good, although the end was disappointing becuase, well, it ended, and this is a six-book series and I want the next book! I think the author is doing a bang-up job with the team. The same can't be said for the SG1/SGA crossover novel "Transitions" by Sabine Bauer. The whole thing just felt 'off'. It's hard to explain but Ronon's saying "ain't" and Jack seems to be 100% Jack I didn't care for - when RDA was barely on set and his lines were mostly inane quips. But on the other hand, I've got a huge stack of horror, science fiction, mystery and action thriller books I picked up at library sales over the past couple years, but hadn't had time to read, so now I can. Unless I get sucked into more animal shows on NatGeoWild, which has some great stuff.